I'm not entirely certain why I agreed to this, but I am scheduled to debate Tom Stossel on NECN's Newsnight with Jim Braude. It should air Monday night, June 2, at 8 pm. The topic is the bill being considered by the Massachusetts legislature that would, among other things, ban drug companies from giving any gifts to physicians. I've covered this issue in some depth here. My opponent has an impressive pedigree, and is an eloquent spokesman for the view that there should be more, rather than less, interaction between physicians and drug companies. This site has links to many of his articles on the issue. I believe that John Stossel, the ABS news anchor who rants against various liberal causes, is Dr. Stossel's brother. If so, I hope he won't be receiving too much coaching from his famous debate-champ brother before Monday. Tune in if you have a chance. I thought I would provide a quick run-down of some of the response to my Wired article on functional neuroimaging. Predictably, most of the comments revolved around Daniel Amen, who has presumably seen a major uptick in book and nutraceutical sales, and new appointments for SPECT scans. Any publicity is good publicity. The neurologist and author Robert Burton emailed me a link to his excellent article in Salon, entitled “Brain scam: Why is PBS airing Dr. Daniel Amen’s self-produced infomercial for the prevention of Alzheimer's disease?” It is absolutely required reading. Ginger Campbell, an ER physician and medical podcaster, contacted me about this brief discussion thread her blog, Brain Science Podcast. long after all the previous timid placebo hopes have been repeatedly dashed, and everyone is running on cold, frozen reality, with no hint of hope fueling the tank. The drug industry’s main trade group, PhRMA, just announced that it will support a congressional bill that would publicly post all drug company payments to physicians. The bill, the Physician Payments Sunshine Act, was initially resisted by drug companies, but recently Eli Lilly announced its support of the legislation, and both Merck and AstraZeneca have followed suit. Given these developments, and given that the bill has substantial support in the House and Senate, it is virtually certain of passage. What would this bill actually do, and what are the implications in terms of scaling down the extent of corruption in industry-supported medical education? You can view The Prescription Project’s fact sheet on the bill here, and coverage of the latest developments from the excellent Politico website here. Essentially, the bill forces drug companies to report any payments or gifts to physicians, as long as they are valued at more than $500. This would include payments for speaking, consulting, travel reimbursement, and various other activities. Payments for clinical research and the value of drug samples would be exempt from disclosure requirements. It's a great start, but unfortunately, the bill misses one of the largest sources of industry payments to physicians: payments to third party medical education communication companies (MECCs). This is the money laundering scheme used by industry to make drug advertising look like objective continuing medical education. A drug company awards a MECC an “unrestricted educational grant” for a conference on, say, antipsychotics. The MECC then hires physicians as faculty members who can be counted upon to say good things about the sponsor’s drug. The checks to these physicians are then nominally written by the MECC, although the drug company is the actual source of the money. These payments typically begin at $1000 and head skyward from there. And this doesn’t include additional thousands for reimbursement of lavish travel expenses. In 2006, drug companies funneled $1.2 billion into this sleazy shell game. In its current form, the Physician Payments Sunshine Act will allow these payments to go completely unreported, because it focuses only on direct financial transfers between drug companies and doctors. On the positive side, all non-CME, explicitly “promotional” talks will be subject to the bill’s provisions. This means that patients will be able to look up their doctors on the Physician Payments website, and find out exactly how much money they accepted from which companies, to do what. I predict a rapid depleting of the speakers bureaus of drug companies, because most doctors will be too ashamed to have this information made public. Only the most mercenary of the hired guns will remain, and they will rapidly lose their credibility as their audience members connect the dots between their financial incentives and the promotional content of their talks. But in what could well become a case study for the Freakonomics column in the New York Times, the bill actually creates strong financial incentives to further distort medical education, precisely the opposite of what is intended. This is because hired guns who do not want to be exposed will simply shift from promotional talks to CME talks, where the third party MECC umbrella will continue to hide them from the “sunshine” of the bill’s requirements. The drug companies will follow the speakers, and we will see commercial support of CME mushroom. Good news for the MECCs. Bad news for medical education. Luckily, the bill’s language is still being tweaked, and I hear rumors that Senator Claire McCaskill, one of the co-sponsors, is pushing for inclusion of a provision requiring disclosure of CME payments. The current issue of Wired Magazine carries an article I wrote about entrepreneurs who market different forms of functional neuroimaging for indications ranging from diagnosing psychiatric disorders to detecting lies. As part of my research for the article, I got SPECT scanned by Daniel Amen at the Amen Clinic in Newport Beach, and received a functional MRI by Cephos Corporation in Massachusetts. 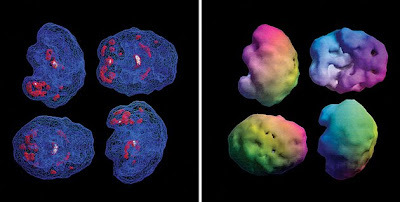 The bottom line is that functional neuroimaging is not ready for prime time in clinical settings, with very few exceptions, such as the use of PET scanning to differentiate frontotemporal dementia from Alzheimer's disease. In addition, Cephos and No Lie MRI's lie detection algorithms are intriguing, and may rival standard polygraphy if current research pans out. I hope you'll read the article and let me know your thoughts. Thus far, most of the comments on the Wired website have been by either Dr. Amen or his supporters, who rely on patient anecdotes, rather than prospective clinical trials, to support the validity of SPECT in psychiatry. Clearly, there's a lot of money to be made in this business, and the allure of riches has clouded the judgments of otherwise well-meaning and intelligent clinicians. Tellingly, one of the Amen Clinic's main competitors, Brain Matters, based in Denver, recently filed for Chapter 11 bankruptcy protection. This financial death spiral came shortly after the company was featured on the PBS Frontline show, The Medicated Child. Functional neuroimaging has great promise for elucidating the neurocircuitry of psychiatric disorders, but most of the neuro-entrepreneurs are leapfrogging over the necessary studies to rush their products to market. It's time to slow down and do it right. The American Medical Association's main ethics committee (CEJA, or the Council on Ethical and Judicial Affairs) has released this report on medical education declaring that doctors and medical institutions "must not accept industry funding to support professional education activities." "... Medicine must ensure that the values and core commitments of the profession protect the integrity of professional education. It must strive to deliver scientifically objective and clinically relevant information to individuals across the learning continuum. To promote continued innovation and improvement in patient care, medicine must sustain ongoing, productive relationships with the pharmaceutical, biotechnology, and medical device companies. However, industry support of professional education has raised concerns that threaten the integrity of medicine’s educational function." "Exception should be made for technical training when new diagnostic or therapeutic devices and techniques are introduced. Once expertise in the use of previously new devices has developed within the professional community, continuing industry involvement in educating practitioners is no longer warranted." This would allow, for example, companies to pay for orthopedists to train surgeons in how to fit the latest artificial hips, or to hire cardiologists to teach physicians how to program the newest pacemakers. These are examples of the few cases in which the companies have special expertise that can't be learned via standard educational outlets, such as professional journals. Note that this exception does not apply to pharmaceuticals, because doctors can best learn about drug prescribing by reading and evaluating the medical evidence. What are the chances that the AMA will adopt this recommendation? Here is a list of the many 2007 and 2006 CEJA recommendations which were approved, indicating that the organization is likely to take this new report very, very seriously. Health Care Renewal discusses a disheartening development in the debate over the Massachusetts' law to ban drug companies from giving bribes--I mean, "gifts"-- to physicians. In the past, I wrote this rambling post about the issue, including links to several letters and editorials printed in the Boston papers. The latest article, published in the Boston Herald, quotes the head of GlaxoSmithKline's operation in the U.S. as implying that if the full legislature passes the ban (the State Senate has already done so), GSK will take their money out of Massachusetts and head to other states that do not "demonize" the pharmaceutical industry. Yawwwwn. It's a threat we've heard before but it's actually quite embarrassing for GSK. Why does the company believe it needs to give pens and pizzas to doctors in order to get them to prescribe their drugs? Are their products so ineffective that bribery is the key incentive for their use? Read this excellent letter in rebuttal, written by Marco Cornelio, a medical student at Tufts. Cornelio writes, in part, "Instead of spending their money on such bribes, pharmaceutical companies ought to be using it for research to produce truly innovative, effective and safe medications." Congress is scrutinizing direct-to-consumer drug marketing, and Allison Bass (author of a new book on the deceptive marketing of Paxil) posted this interesting entry on her new blog. Researchers at Duke University have listed cognitive techniques drug-makers use to distract them from comprehending all the pesky negative information that the FDA requires be disclosed. For example, in an ad for the allergy drug Nasonex, a distracting animated bee appears during the rapid fire recitation of side effects. But when the benefits of Nasonex are described, the bee hovers quietly. In the past, I have supported DTC ads (see here) because I have felt the public health benefits may outweigh the problems with biased drug information. After reading about this new study, I may have to revise my position! Is Pharmaceutical Promotion Protected by Free Speech? Recently, the New England Journal of Medicine published this interesting Sounding Board article by Aaron S. Kesselheim and Jerry Avorn, both of whom are physicians at Brigham and Women’s Hospital and Harvard Medical School. They are leading proponents of efforts to limit the use of prescription data-mining, and assisted the state of New Hampshire in its ultimately unsuccessful efforts to ban the practice (see this article for some background on various legislative actions). At issue is whether prescription data-mining and other promotional activities are considered “free speech” and thus protected by the First Amendment. This has been a major argument of the pharmaceutical industry in its ongoing litigation in several states that are considering bans. The authors distinguish personal speech, which is strongly protected by the First Amendment, from commercial speech. Whereas any limitation on individual free speech requires that the government have a clear interest in limiting a particular person’s speech (a high legal standard that is rarely met), limitations on commercial speech are based on different standards. The main framework used by courts is called the “Central Hudson Test,” after a 1980 case in which a utility company sued New York State over regulation of their advertising. Based on that case, courts now allow limitations on commercial speech if three conditions are met. First, the government must have a substantial interest in the issue (in the case of prescription data-mining, the government indeed has a substantial interest in the relevant issue, which is public health); second, the proposed regulation must directly advance those interests (banning data-mining reduces the potential for non-scientifically based physician prescribing behavior); and third, the proposed regulation must not be more extensive than necessary to achieve its goals (the New Hampshire courts ruled against the ban partly because it agreed with Pharma arguments that there are less restrictive ways to counteract drug company misinformation, such as programs to better educate doctors about evaluating promotional claims). I found this a valuable article for understanding some of these issues. Happy reading! John Shelton, PhD, may well be one of the most influential people in the field of psychiatry—though he is not a psychiatrist, and you may never have heard of him. He is the publisher of the Journal of Clinical Psychiatry, and is thus, in my mind, both Dr. Jekyll and Mr. Hyde. 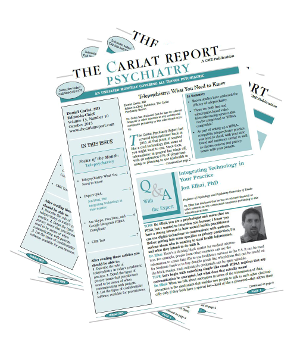 Jekyll-wise, he produces an excellent journal, brimming with clinically relevant articles covering topics that front-line psychiatrists care about (as opposed to, for example, Archives of General Psychiatry, which is filled with basic science articles). But in his Mr. Hyde persona, he publishes dozens of industry-supported CME Supplements, each of which is an advertisement for a product marketed by the sponsoring company. I’ve never been shy about criticizing these supplements (here), and nor have other critics (here). The conversation was brief but cordial. I reiterated that I have no problem with the main journal but that the supplements appear to be promotional, almost without exception. He and Jane Eckstein, who is the director of their CME operation, maintained that the content is developed completely independently of drug company input. This is the standard bone of contention between those on different sides of the commercial CME divide, and both arguments are predictable, so I didn’t tarry long at the booth. As I left, I realized that it all depends on what you define as “bias.” If you define it as inaccurate information, then Shelton and Eckstein are correct, since their supplements are carefully vetted for accuracy. But if you define it as manipulating the choice of accurate information to serve a promotional objective, then Team JCP is guilty as charged, since each supplement covers a topic of commercial benefit to the sponsor, and information is chosen to highlight advantages of the sponsor’s product. To argue that the information is accurate and helpful to readers is not relevant. The information in drug ads is also accurate (the FDA makes certain of that) but nobody would argue that they are not also promotional. Dr. Shelton mentioned that commercial CME covers important off-label uses, which FDA forbids companies to discuss (although recent guidelines may change this). But, in fact, doctors who don’t participate in industry CME are also free to teach about off-label uses, and they do so, frequently. The debate will continue. And while I believe that you are doing the wrong thing, Dr. Shelton, I applaud you for being willing to engage with the “enemy”! More APA Notes: Conversations with the "Enemy"
About 20,000 psychiatrists attend the APA annual meeting, and as you wander around the convention center, you bump into people you wouldn't ordinarily be rubbing shoulders with. Even people you might go out of your way not to rub shoulders with. This is a good thing, because you find out quickly that your "enemy" is no monster, but a person just like you. And possibly not an enemy at all. Two examples from the 2008 meeting stand out; I'll describe one today and one tomorrow. As I was browsing the publisher's exhibit area, I saw Stephen Stahl at the Cambridge University Press booth, signing copies of the latest edition of his immensely popular textbook, Essential Psychopharmacology. Apart from being a prolific author, Stahl is the head of NEI (Neuroscience Education Institute), a medical education company specializing in industry-funded CME. 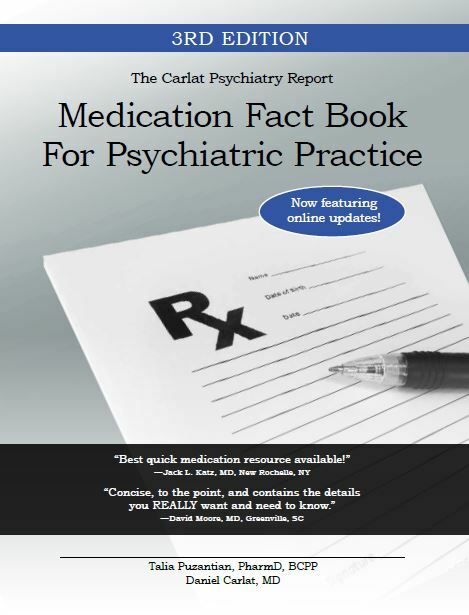 I mentioned him in this prior post, when I put him in the company of Charles Nemeroff as one of the more industry-conflicted psychiatrists in the profession. Well, I went up to him and introduced myself, and we got talking about industry influence in psychiatry. "We're moving away from pharma funding," he said. For example, he said that he plans to stop participating in industry-supported symposia. "I consult with industry," he said, "and so I shouldn't be doing these symposia." I told him that I was on an APA work group tasked with adapting to future loss of industry funding. I asked him how he thought the organization would manage. "We're not going to make as much money," he said, "and maybe we shouldn't. Sometimes we just have to do the right thing." I was impressed. But it was ironic that our short conversation was just then interrupted by a Pfizer employee asking him to sign her copy of his book. "We'll be seeing you tonight, Dr. Stahl," she said graciously. I don't know what event she was referring to, but I do know that the Pfizer was giving away his book at their display in the exhibit hall, and had scheduled him to sign copies for the dozens of psychiatrists happy to stand in line for a freeby. Nonetheless, I believed Dr. Stahl was sincere in his plans to reduce his spigot of industry money, and I hope that we'll start seeing changes in NEI's business model over the coming year. Tomorrow: Close encounters with John Shelton, publisher of Journal of Clinical Psychiatry. 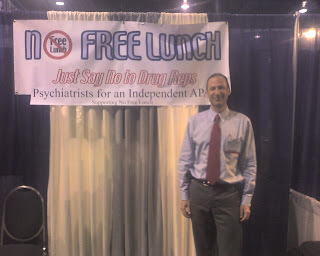 Here I am at the No Free Lunch booth in the Exhibit Hall of the annual meeting of the American Psychiatric Association. The Pristiq coffee lounge is buzzing with caffeine-seeking psychiatrists a few yards away. Beyond that, a quarter mile of exhibits, small and large, some from drug companies, publishing companies, software companies, and physician placement firms. We offer a No Free Lunch Pen Amnesty program, in which doctors can exhange their drug company pens for our No Free Lunch pens. Hundreds of psychiatrists have strolled by, amused and intrigued. Many are skeptical, believing that lunches and pens do not influence their prescribing habits. Others tell stories about having prescribed Invega after the Risperdal rep came by and later wondering why on earth they did so. Another doctor said that, as an intern, he prescribed nothing but Zoloft because the Pfizer rep got to him before the other reps. These are great discussions, often coming back to the question of "so what?" Are patients actually harmed by drug company gifting? These are difficult questions. My own feeling is that patients want me to make my prescribing decisions based on scientific grounds, and not based on the giving of gifts. 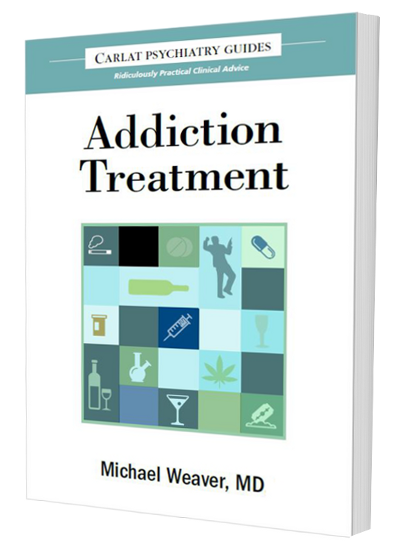 I don't need the gifts, and I can get much more reliable information about drugs by reviewing the journals checking internet websites. Time to sign off--the exhibit hall just closed, and they are turning the lights on and off. More stories later this week!